In this stylish, independently-financed film noir, Screenwriter Stacia Crawford brings to the screen an intriguing tale of predatory deceit, revenge and murder set in the Golden Era of Hollywood when studio moguls controlled the lives of everyone working under their iron-clad contracts. And speaking of moguls, Crawford's script is filled with more twists and turns than those caused by the moguls carved on the legendary Exhibition Ski Run at Sun Valley. At first glance, the well-crafted, complex story in STRAIGHT FORWARD concerns a successful screenwriter and his aging movie star wife who are having trouble conceiving a child of their own. Together they conceive (pun intended) a plan to hold a series of open auditions to find an unknown actor to become the lead in their next motion picture project. However, acting ability is of no consequence to this couple as they are actually looking for a downtrodden loner with no family and no friends who the aging starlet can seduce and then dispense with -- permanently. A young film executive, the son of the studio head, and his personal assistant are the only others who are in on this deadly deception. Unfortunately, the young loner they end up choosing has ambitious plans of his own, and he may be aided by an accomplice -- someone with drive, determination and a dangerous hidden agenda as well. The ensemble cast is uniformally excellent. Kristen Vermilyea does a superb job playing Eileen, the aging movie star. She also shares producing credit with Ms. Crawford who portrays Maggie, the young secretary who is much more complex than what appears on the surface. Lev Gorn's performance as the screenwriter is solid, as is Gabe Fazio's in the role of the licentious loner. 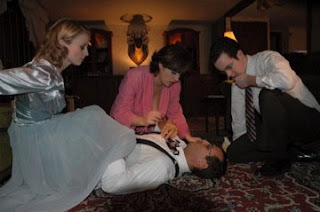 Rounding out the cast are Tony Luke, Jr. as the sheriff (think Buford T. Justice does noir) and Jennifer McCabe, whose frenetic performance as the crafty, crazy neighbor steals most of the scenes she's in. 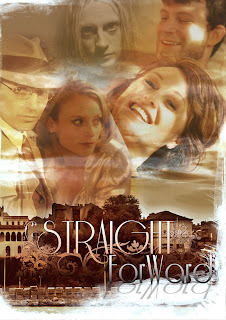 STRAIGHT FORWARD is Director Jason Noto's feature film debut. He does an admirable job and has since gone on to directing two additional feature-length motion pictures; a just reward for a job well done. Assisting Noto in effectively capturing this time period with extremely limited resources is Sean Duhame. Mr. Duhame is credited as both the Production Designer and the Art Director and he, too, has gone on to additional projects including considerably larger budgeted films such as 21 and THE PINK PANTHER 2. The past few years have been extremely hard on everyone operating in the low-budget, independent arena. According to the New York Times, the Sundance Film Festival, originally established to be the showcase for small, independent productions, now receives over 2,600 feature film submissions each year. Of this number, only around 120 -- fewer than five percent -- are selected for screening. And of these, maybe ten will be picked up for any kind of theatrical distribution. The hard, cold truth is that these numbers just scratch the surface. For example, most distributors receive somewhere between 40 and 100 completed feature films per month to evaluate for possible acquisition. Generally speaking, two or three might be lucky enough (at best) to be acquired for limited DVD distribution. Accordingly, it is an extremely noteworty accomplishment for any low-budget, independent project to secure distribution of any kind.